A multi-element preconcentration–separation technique for metal ions is established. 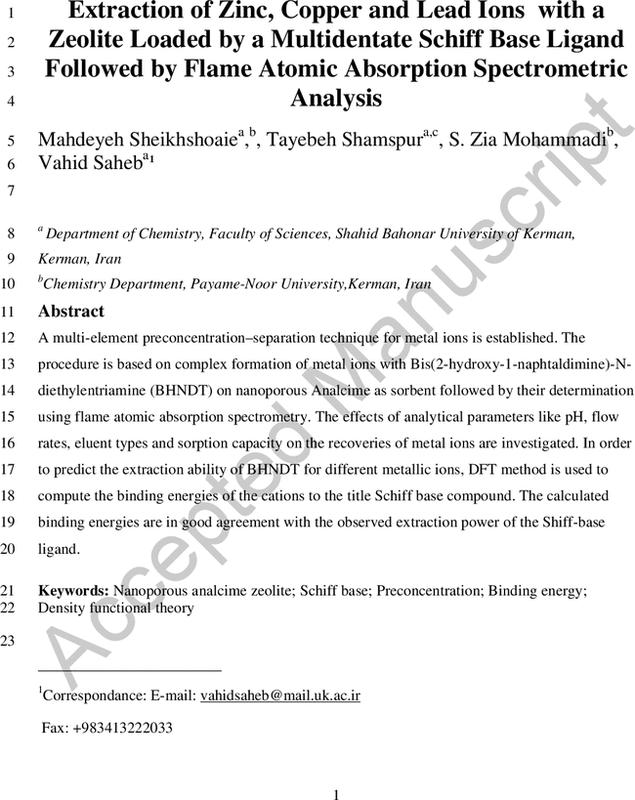 The procedure is based on complex formation of metal ions with Bis(2-hydroxy-1-naphtaldimine)-N-diethylentriamine (BHNDT) on nanoporous Analcime as sorbent followed by their determination using flame atomic absorption spectrometry. The effects of analytical parameters like pH, flow rates, eluent types and sorption capacity on the recoveries of metal ions are investigated. In order to predict the extraction ability of BHNDT for different metallic ions, DFT method is used to compute the binding energies of the cations to the title Schiff base compound. The calculated binding energies are in good agreement with the observed extraction power of the Shiff-base ligand.